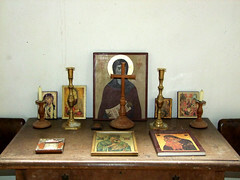 This little church has seen great changes in its lifetime, perhaps none so dramatic as those of the last few decades. It sits across the fields from the beautiful, secluded red brick of Chilton Hall, a footpath to it running through woods and between fields for about a quarter of a mile. My wife remembers blackberrying here as a child some thirty-odd summers ago. She took her shoes off to wander barefoot in the hot dust; as she leant across a ditch to reach the fruit, a rat broke cover and ran across her feet. 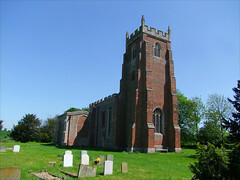 The church is similarly built largely of red brick with a flint nave, a pleasing contrast with the green of the trees and hedgerows. But the birdsong that was once all you'd have heard has been replaced by the roar of traffic on the Sudbury bypass a few hundred yards to the west, and a great commercial and industrial estate has reached and embraced St Mary, so it is no longer lonely and isolated. 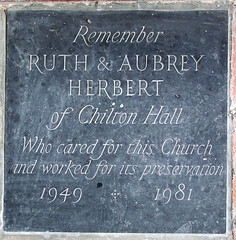 Be that as it may, the walk from Chilton Hall through the woods and fields is still possible today, although the expansion of Sudbury may make the building of houses here increasingly likely. 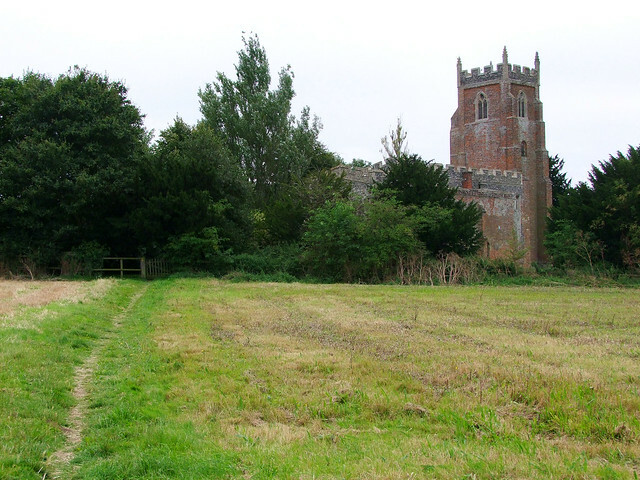 The irony is that the church's former loneliness was very nearly its demise, for the tiny parish could no longer support its church by the late 1970s, and it was drawn into the parish of Sudbury St Gregory, with St Mary being declared redundant and left to its fate. 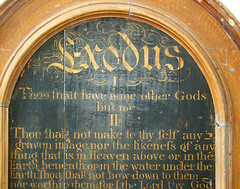 Fortunately however, this little church has some very energetic and enthusiastic friends who rolled up their sleeves and take good care of it, and in the 1980s it was vested in the care of the Churches Conservation Trust, who are now its custodians. 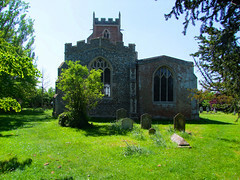 The churchyard is a a narrow oasis, making the church appear larger than it actually is, and the two most striking features of the building are the tower and the large chapel on the north side of the chancel. 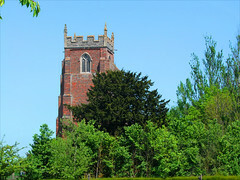 The splendid red brick tower, one of the loveliest in Suffolk, was built on the eve of the Reformation. It has more in common with the red brick towers just over the border in Essex at Gestingthorpe and Wickham St Paul. The Victorians topped it with battlements and turrets, and it is a fine sight through the industrial units from the west. 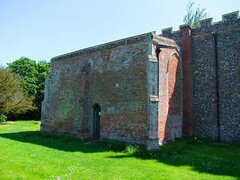 Contemporary with it is the large chantry chapel to the Crane family to the north of the chancel, but the body of the church isn't much older, being good Suffolk Perpendicular. 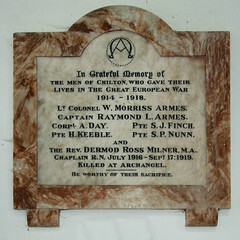 What we have, then, is a building that was constructed pretty much in its entirety during the lifetimes of some of its parishioners. 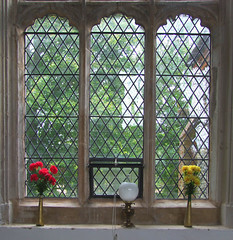 You can collect the key from a cottage beyond the Hall, and you let yourself into the Crane chantry chapel. 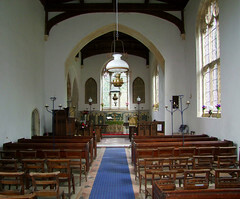 This is a large open space, not much smaller than the nave of the church to the south-west of it. 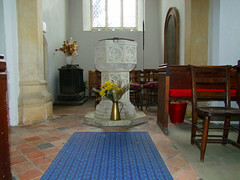 The earliest of the Cranes lie up one corner, beside the chancel. 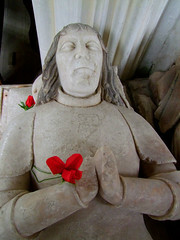 George Crane died in 1491, and looks rather lonely here, seeing out the centuries in alabaster. 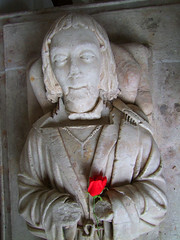 But there is a beautifully serene expression on his face, and it is hard to think that it was not intended. 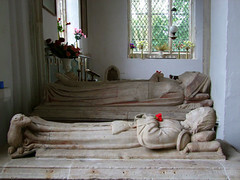 Above him to the south are his parents Robert and Anne Crane, also in alabaster of 1500. 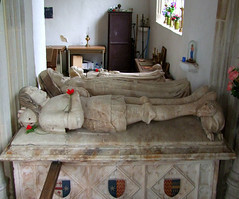 He is in armour without a helmet, she wears the collar of Ss. 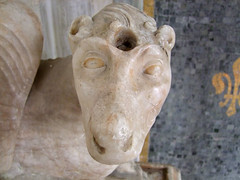 The little unicorn under his feet has mislaid his horn, and only the socket remains to tell us what he is. 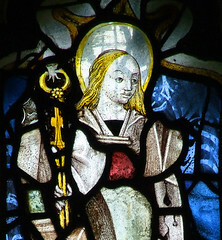 Mortlock notes that Robert and Anne appear among the donors in stained glass a few miles off at Long Melford. Cranes of a century or so later are on the west wall of the chapel, full of self-importance and with nothing like the humanity of their ancestors. In the presence of these grand figures, it would be possible to miss what is probably the greatest treasure of the church. 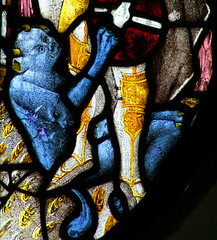 In the east window of the chapel are two relatively complete figures in 15th Century stained glass, of St Apollonia holding her tooth in pincers and St Michael dispatching the devil. They are exquisite. 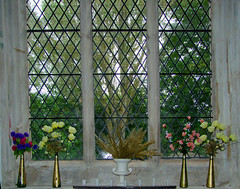 You step through into the nave, which is simply furnished and full of light. There is no stained glass here. 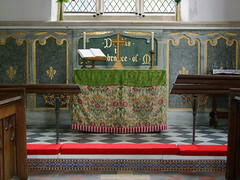 The low dado remains of the screen, and the little chancel cannot help but seem a little cluttered. 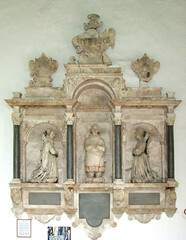 Without the Crane chapel, this church would be by no means as significant. 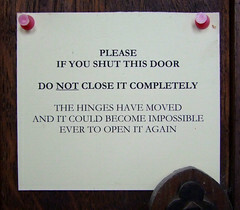 But it would still be very lovely. There is such a sense of love here, everything well-kept and well-cared for, everything in its right place. 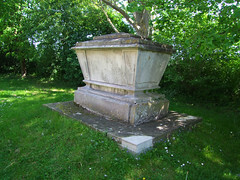 Outside, in the churchyard, a small number of gravestones remain, and they're worth exploring. One that particularly caught my eye was to a child called Sparrow Brand Steed, the curious name perhaps a result of non-conformist parents deliberately giving a non-Christian first name. 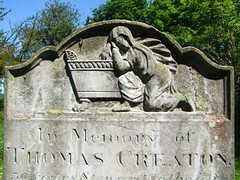 Beside it, a woman weeps on the urn of Thomas Creaton, a former servant at the Hall.